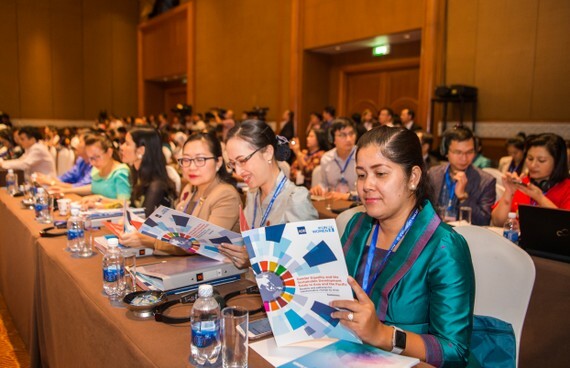 Countries in Asia and the Pacific must accelerate progress on gender equality in order to reach the ambitious and progressive global goals under the 2030 Agenda for Sustainable Development, according to a new report by the Asian Development Bank (ADB) and UN Women released yesterday at the ASEAN Ministerial Meeting on Women in Hanoi. The report, Gender Equality and the Sustainable Development Goals in Asia and the Pacific: Baseline and Pathways for Transformative Change by 2030, is the first comprehensive review of the status of women and girls in Asia and the Pacific under the Sustainable Development Goals (SDGs) framework, which highlights the remaining challenges facing women and girls and how improving their situation can help achieve the SDGs. Under the 2030 Agenda for Sustainable Development, achieving gender equality is both a stand-alone goal (Goal 5) and a priority across the 16 other social, economic, and environmental goals, such as ending poverty and ensuring education for all. This comprehensive review of the available data to track progress on the status of women and girls in the Asia-Pacific region shows the strong interlinkages between achieving gender equality and achieving Agenda 2030. The report shows that, while Asia and the Pacific has made progress in some areas of gender equality, there remains significant inequality for women and girls. For instance, as many as one in two women has experienced physical and/or sexual violence from an intimate partner in the past 12 months. Women and girls also spend as much as 11 times more of their day than men and boys on unpaid care and domestic work. Some countries in the region, meanwhile, have the highest incidence of "missing women" in the world due to discriminatory practice which favors sons, while progress on reducing maternal mortality rate has also been uneven. In terms of professional and economic opportunities, women in Asia and the Pacific have less access to financial services and productive assets, while girls are less likely than boys to be in organized learning before primary school. Asia and the Pacific is the only region globally where the gender gap in labor force participation is increasing. Women also remain underrepresented in decision making and leadership roles with fewer than 1 in 5 parliamentarians in Asia and the Pacific being women.